Marijuana legalization has a host of very real consequences for the country: the neutering of a dangerous black market, the slow acknowledgement of alternative medicines, and an influx of jobs, taxes, and merchandise that will shake America’s economy to the very core. However, we’re too busy swooning over the lush interiors of America’s emerging dispensary architecture to care about any of those things. The emerging legal marijuana industry is the fastest-growing industry in the United States. Indeed, there are even architecture and design firms that specialize in the design of dispensaries and grow rooms. Erich Pearson, founder of the Sparc dispensary in San Francisco, believes that the design should “remove the stigma around cannabis and make people feel marijuana is normal.” Gone are blacked-out windows and the faint smell of pachouli at your local head shop, the next generation of dispensaries are well-lit, airy, and spacious. These ten interiors—best ogled with a spliff in hand—perfectly forecast a new design typology, coming soon to your neighborhood. 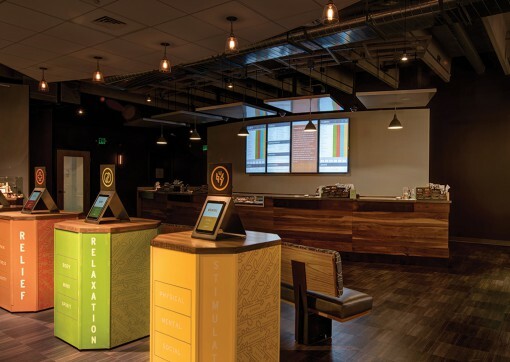 In Aurora, Colorado, Good Chemistry uses sleek design to put the spotlight on the four color-coded categories of the recommended uses for cannabis: stimulation, sleep, relief, and relaxation.